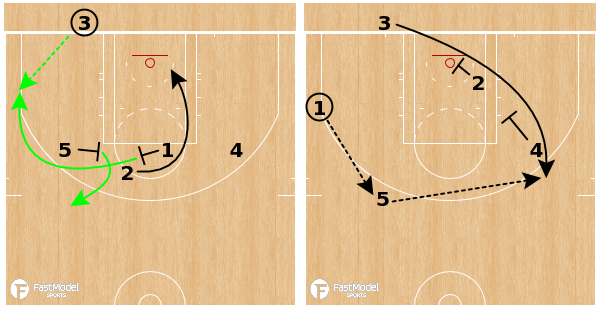 The first round of the 2018 NBA Playoffs has been incredibly competitive and exciting, and provided some great #XsOs as well. With the high stakes of the NBA postseason, preparation is at an all time high for coaching staffs. Having scouted teams throughout the regular season, opponents will know each other’s strengths and weaknesses pretty well by this point. This forces coaches to make adjustments, tweak plays, add counters and more – it’s like an NBA version of a chess match. Finding the right combination of moves is the key to victory, especially in a 7-game series where a play or two can decide a game and ultimately which team moves on to the next round. 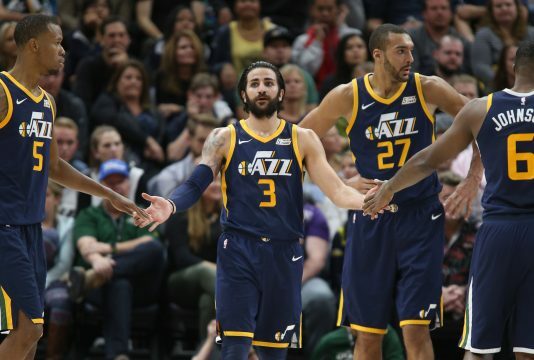 Let’s take a look at some of the best sets we’ve seen so far in the NBA Playoffs that have caused problems for defenses. Stop by the PlayBank throughout the Playoffs to see all submitted plays from #TeamFastModel contributors, and follow on Twitter each night for live #XsOs as well. Click on a play to view more info and download it to your FastDraw library. 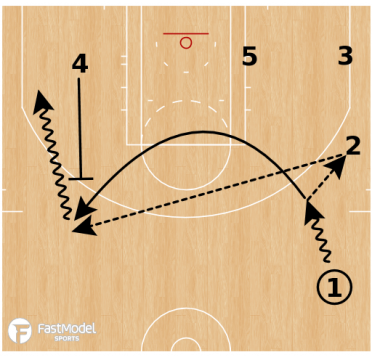 As the defense begins to settle in to defend half court offense, the Blazers execute this quick secondary action to catch the defense off guard, as you can see in the video clip below. This puts pressure on defenders to communicate the coming screens, but it’s already too late. 2 clearing to the corner is crucial for spacing and to occupy the only real threat to help. For a different look, 3 has the option to come off 4’s back screen as shown in frame 2. The Wizards heavily depend on high ball screens to buoy their offense. 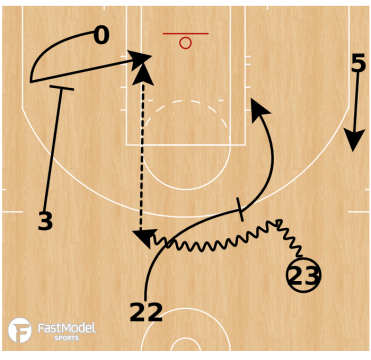 Scott Brooks leverages having two dynamic ball handlers (John Wall and Bradley Beal) by positioning them at opposite sides of the floor – ready to attack a shifting defense before penetrating into the lane. This action moves the defense from east-west before moving it north-south. This action also allows for ample roll or pop opportunities depending on how the defensive big plays it, as there is no help available. 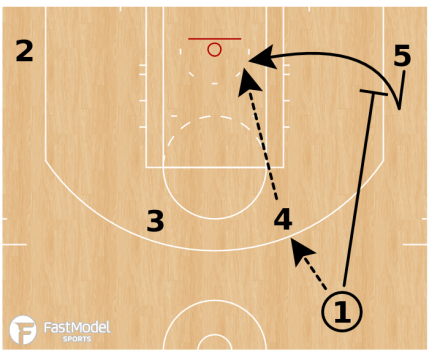 The key to this quick play is 3 setting the back screen on x5. This not only opens up the lob opportunity, but prevents x5 from being able to help on the drive as well (see clip below). Toronto’s mandate to reset its culture has permeated through its playbook with series such as this. While Dwayne Casey still uses much of his playbook from previous seasons, the Raptors have implemented continuity actions that have less defined outcomes than in years past. 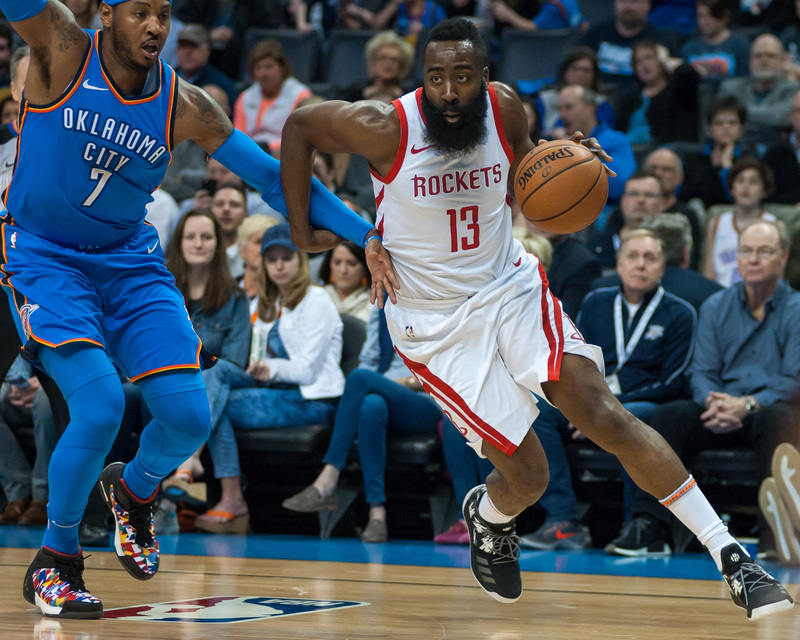 This action is run with the starting lineup, as well as the revered bench unit, and the combination of ball screens, stagger screens, down screens and dribble hand offs make it incredibly tough to defend. 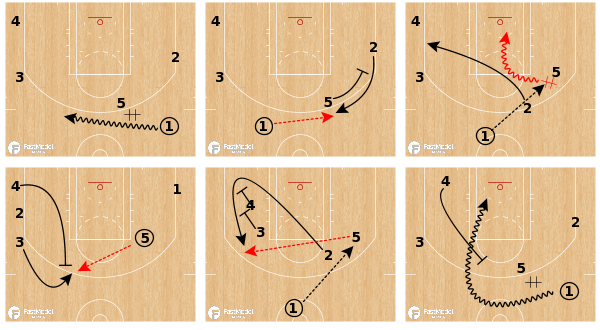 The Cavs ran this early offense drag screen set in the first quarter of Game 3 vs the Pacers. Timing is the biggest key when it comes to executing this quick hitter correctly. If the players involved in the pin down action aren’t correctly spaced or timed, the backdoor cut won’t work. Common action the Sixers run for J.J. Redick to get an open 3pt attempt out of a BLOB. Slip opportunity always available, especially with a shooter as deadly as Redick drawing attention from the defense. Begins with a simple stagger to get the ball inbound and flows seamlessly into Spain pick and roll action (back screen on the ball screener’s defender). With a mobile and athletic center like Rudy Gobert, even the smallest window allows the Jazz to throw a lob for a layup or (usually a) dunk. Proper spacing by 3 and 4 in the corners is key in keeping the lane open. The Washington Wizards will run several inbounds plays that start with a Zipper cut. 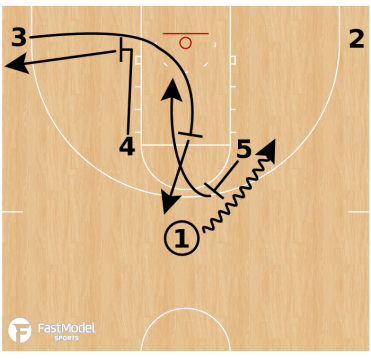 This SLOB used by Scott Brooks allows the inbounder to get an open pass to a guard coming toward the sideline before looking to the weak side for a quick pindown. The Wizards have several good off-ball shooters that use down screens well, and this is one play that allows them to use that action. Also an opportunity for a big slipping to the rim if defender jumps to the shooter. The high post area is a great place for LeBron James (4) to catch and use his next-level passing ability to create scoring opportunities for teammates. The base Horns alignment, with its endless options, ensures that the defense doesn’t know what’s coming. As always, spacing is key to occupy help and open up the lane.